I usually try to make a point of not repeating myself too much here on the blog. Unless I have something new to add to what I’ve said before, I’ll normally avoid posting about something again. I’ll make an exception for snow fleas. Ever since I discovered them last winter, I find myself inordinately pleased to spot some during my hiking. I’m not sure why; they’re not (it turns out) uncommon, nor are they particularly special to look at. But something about them just tickles my toes. 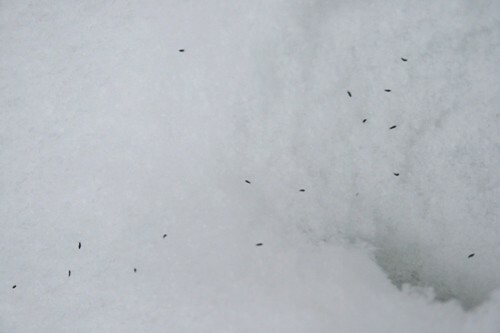 I saw my first snow fleas this weekend, on a “balmy” afternoon where the sun had been out for a bit and the temperature had climbed to reach the freezing point (0/32). Most likely they’d already been out and about for a while, and it just took me this long to pay attention. It’s not as though they jump out at you, exactly. In the photo above, for instance, I counted about 60. But they’re a very underwhelming 60, and one could be forgiven for thinking they were simply specks of dirt, debris, or maybe little grass seeds that had scattered on the snow. They usually move about in groups, however, which tends to make spotting them easier. One tiny speck is easy to overlook; dozens of tiny specks might actually be something interesting. If you peer close enough, you can see the tiny legs and antennae that identify them as invertebrates and not scattered seeds. They’re not actually insects, but are part of a sister class to insects, the Entognatha. They’re the only six-legged critters to be found wandering about Antarctica of their own accord. They prevent themselves from freezing through a special antifreeze protein in their blood, which is being investigated for use in extending the transit life of transplant organs. No one seems to know what they’re doing on the snow in the winter. One hypothesis is that they feed on algae that grows on the snow or on tree trunks. More info recounted in last year’s post, if you’re interested. The photo with them near the grass stalk demonstrates how small they are. I’ll rely on your pix; my eyes probably wouldn’t spot those critters anymore. I bet if you knelt down near the foot of a large tree on a mild mid-winter day, Lavenderbay, you might be able to spot them. They look for all the world like dark specks of debris – until they jump and are suddenly a few inches away. What an interesting post. After reading your post, I tried other sites to find out if they bite humans and couldn’t locate any info on this. In your research did you ever come across this info? No, I don’t believe they of any concern to people, Marie. 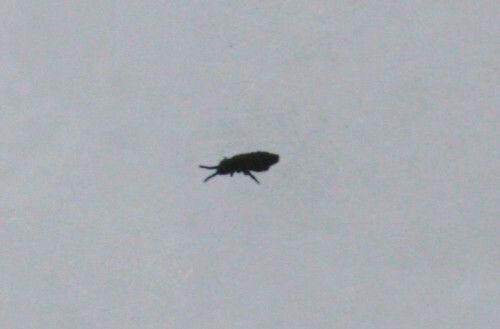 They’re not actually related to the fleas that our pets bring in, they’re just called by the same name for their resemblance to the pests in terms of their small size and ability to jump amazing distances. Algae that grows on snow. Now THAT’s a fascinating concept. Must be some highly ephemeral algae. I had a spider walking across the surface of my ice-covered pond a few weeks back on a very cold day. That shocked me. Know anything about that? 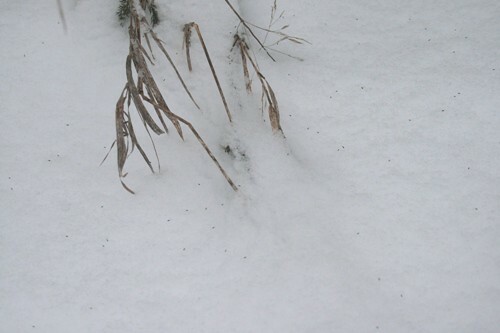 I don’t usually think of insects as being out and about in cold and snowy weather. In any case, thanks again for a stellar blog and best wishes for a happy and healthy New Year. That was my thought, too, Gerry. I don’t know what the story is behind the supposed algae. There is, however, algae on tree trunks that persists year-round that they may feed on. As for spiders, it seems there are a few species of exceptionally cold-hardy arachnids. I found a couple last year – I wrote about them here. Happy holidays and all the best in the new year, too! Thanks, Barbara. Good luck with the search – once you spot your first ones, you’ll be amazed at how common they turn out to be! Thanks, Scott! I’m a regular lurker on the blogs I read, too. Glad you’ve been enjoying it! I know what you mean – it’s a wonder that I ever make it more than a few feet from my car, trying to make sure I look up, down – and focus near & far.